Christmas might be contained in its dread North Pole tomb until it bursts free next year and once again unleashes festive hell on earth, but we are still very much in the midst of the holiday season. This means that many of us, myself included, remain under our relatives’ roofs, or they’re under ours, possibly until the year is over. To pass the time, I’ve been playing 2016's Doom on the Switch. I tend to lose myself in a game or two every holiday season, but never before has one clicked like this—let alone one that I’ve previously beaten on another platform. I’ve come to the inescapable conclusion that Doom is the ultimate holiday game. Let’s run down the reasons. This is the most obvious of the bunch. Returning home for the holidays is super relaxing until it’s super not. Family getting on your nerves? Kill some demons. Uncle wants to argue more about Colin Kaepernick? Kill some demons. Is your mind, bored and listless, probing the cracks and crevices that lead to the traumatic childhood origins of your neuroses? Definitely kill some demons. Even on the Switch’s tiny speakers, Doom’s audio makes it all so satisfying. Each meaty crunch is like an egg cracking open, your stress and anger oozing out. Oh, and then there’s the metal AF soundtrack, which science says will calm you down (probably). When did the holidays get so complicated? Used to be, you’d open some presents, eat some food, and sleep until the football men disappeared from the television. Now there’s hours, even days, of preparation involved, not to mention countless Facebook events and social obligations to juggle. Close your eyes. Imagine it revving up and slicing right through all your troubles as your troubles’ feeble hands rise to block it, only to give way like blood-soaked wrapping paper. Inhale. Exhale. Smile. Did you know that this is how Santa obtained enlightenment and became king of Christmas? It’s true. Look it up. Doom is a sumptuous dessert plate in video game form. Every interaction, whether it’s nailing a Hell Knight with a shotgun blast or just clambering onto a ledge, is rich with full-bodied flavor. And yet, it will never make you feel sick or gain weight. It’s the best part of the holidays, infinitely repeatable. Is there anything more Christmas-appropriate than punching demons, the spawn of Hell, so hard that they break in half and decorate the landscape and walls around them with festive arterial sprays? I mean, seriously. If Die Hard is a Christmas movie, Doom is a New Year’s odyssey. The subtext is so plain to see that it’s practically just regular text. There are fireworks all over the place, and everyone’s drunk—or I guess zombie demons, but that’s basically the same thing. More importantly, though, it’s a game about resolve. 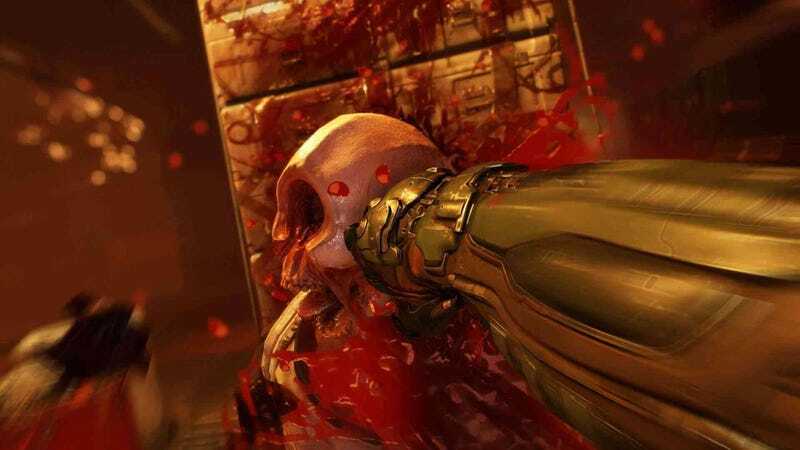 Doom Guy’s single-minded determination to break everything by kicking it to death no matter how much various jerks in his life protest is truly inspiring. You want a role model for your New Year’s resolution? Look no further. This year, I resolve to be more like Doom Guy in everything I do(om).